Join us as a chapter begins in birding the Pacific Ocean off Oregon! 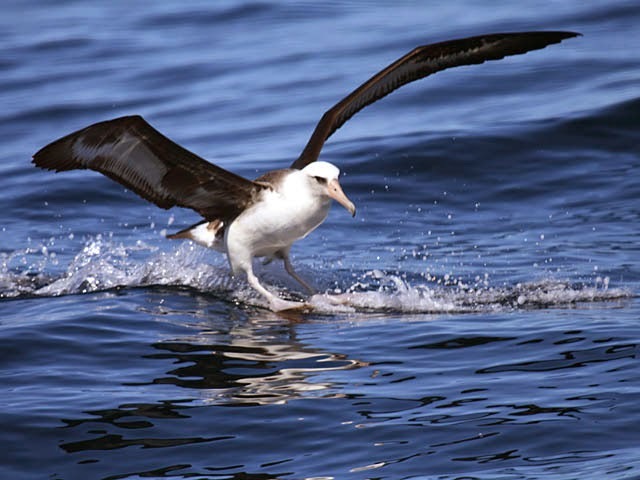 The first trip of the new Oregon Pelagic Tours is an 8 hour winter seabirds trip. This particular trip goes out of Newport, Oregon about 25 miles. The price will be $140, with a discount of $10 to the first ten people who register -- registration is only complete when payment is received. The success rate for pelagic trips offshore in the last 9 winters has been 6 of 9 (67%), which is quite good--only 3 trips canceled for rough seas. But you should have alternate land-based birding plans--just in case. The success rate for finding Laysan Albatrosses when we do get offshore the last 9 winters is 6 of 6 (100%), many with multiple sightings! Possible weather date: February 21. We are experimenting with offering a second date as a back-up if our trip weathers out on February 7. This alternative will only work if most of the February 7 participants are also availaible to go out on February 21. Please indicate on your reservation if you would be willing to go on this date if the February 7 date is weathered out. Price: $130 for first 10 passengers who register and send payment; otherwise $140 per person. To reserve your space click on the Reservations tab above.